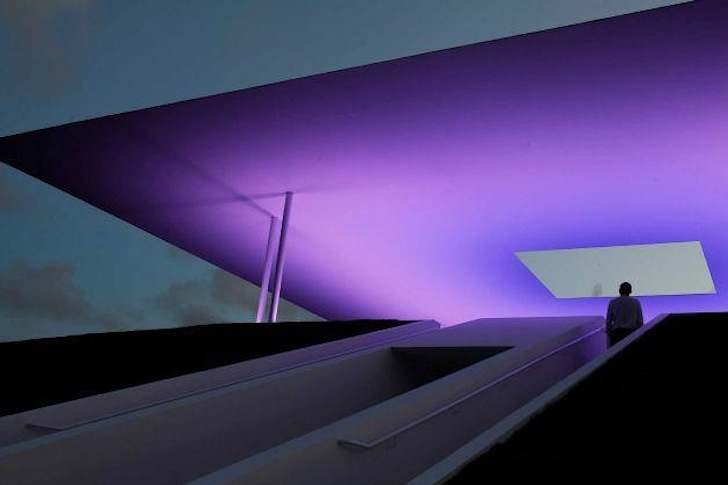 Twilight Epiphany Skyspace by James Turrell Suspends Time and Space With LEDs in Houston | "Global Possibilities"
James Turrell’s Twilight Epiphany Skyspace is a breathtaking design that suspends time and space under the Texan sun. A magnificent 100 square foot grass berm topped with a 72 square foot floating canopy, the Rice University installation is equipped with a complex arrangement of LED lights. The best experience is said to be underneath the canopy as it changes color in tune with the Texan sun! These interact with the natural light present during sunrise and sunset, creating an awe-inspiring space for students and Houston residents to reflect on the sublime majesty of nature. 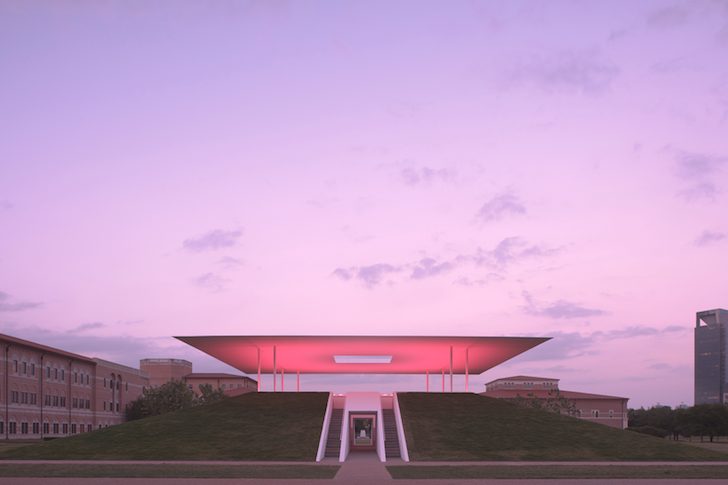 Turrell worked with Thomas Phifer and Partners as well as Linbeck contractors to realize the project’s construction, which consists of grass, concrete, stone and composite steel. The rooftop LED light sequences are carefully arranged according to the solar calendar so that light and music shows, available six days a week in summer, never occur at exactly the same time. The two-level pyramidal structure situated between the Shepherd School of Music and Jesse H Jones Graduate School of Business accommodates roughly 120 people, 44 of which fit in the ground floor chamber. 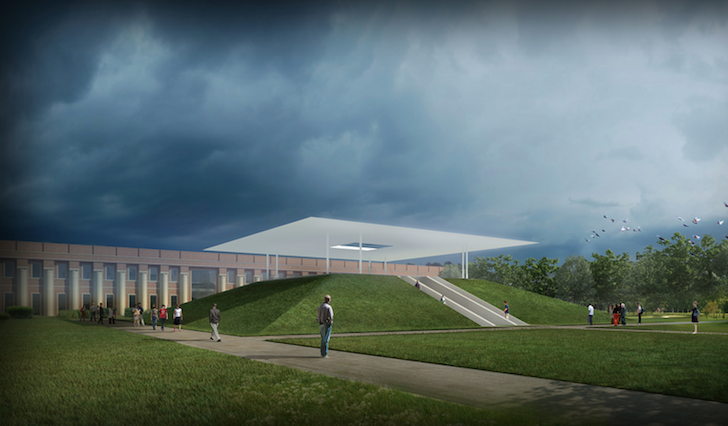 It is acoustically engineered for both musical performances and as a lab for Rice University’s music school students. 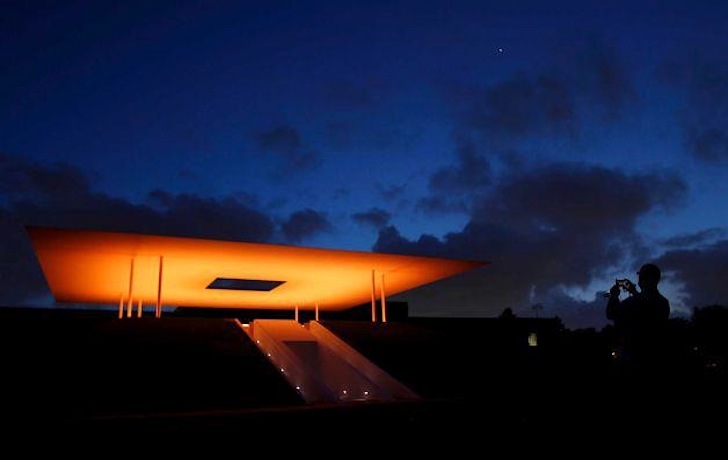 Twilight Epiphany is the 73rd and among the largest of Turrell’s pieces erected in inspiring spaces around the globe. Engineering genius aside, no other public art project on campus and maybe all of Houston has been so effective at giving residents such a peaceful and special respite from the outside world. The multimillion dollar installation is open to the public 6 days a week during summer.